Printed wallpaper is lots of fun, and can be strangely appealing even if you don’t really consider yourself a printed wallpaper type of person. Where to embrace this primal urge for pattern and colour? Why, in the children’s bedroom of course, where basically anything goes in terms of décor. Wallpaper designers, recognising the huge potential of this market for their product, have obligingly churned out endless bright rolls designed to catch the eye of kids – and many of them are really very beautiful and original. 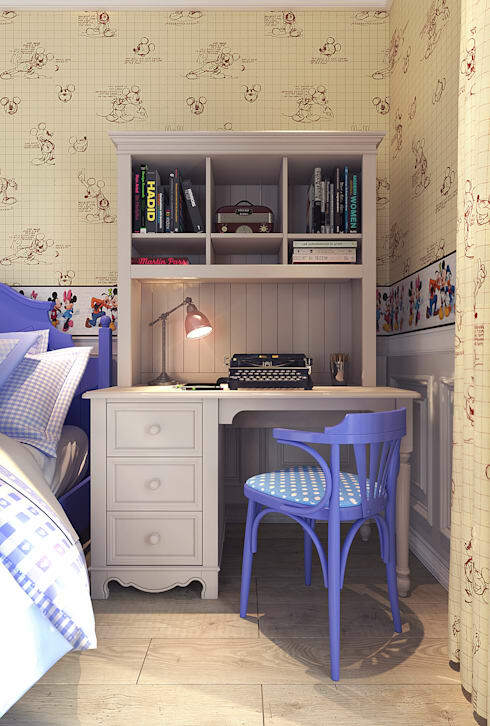 Take a look at these pictures for a heap of golden ideas on incorporating fun wallpaper into your own children’s rooms. This adorable wallpaper invites birds to bring their tiny houses into YOUR house, keeping your child company throughout every season. This print works so well because not only is its subject matter cute and cuddly, it’s also interesting and varied. There are several different houses and birds to look at, and your child can look at it often without getting bored, picking out their favourite birds and houses and quite possibly assigning imaginary personalities to each. This room seen here belongs to a girl, but there isn’t anything inherently girly about this wallpaper; it could just as easily provide a focal point for the bedroom of a male child. How’s this for a feature wall? 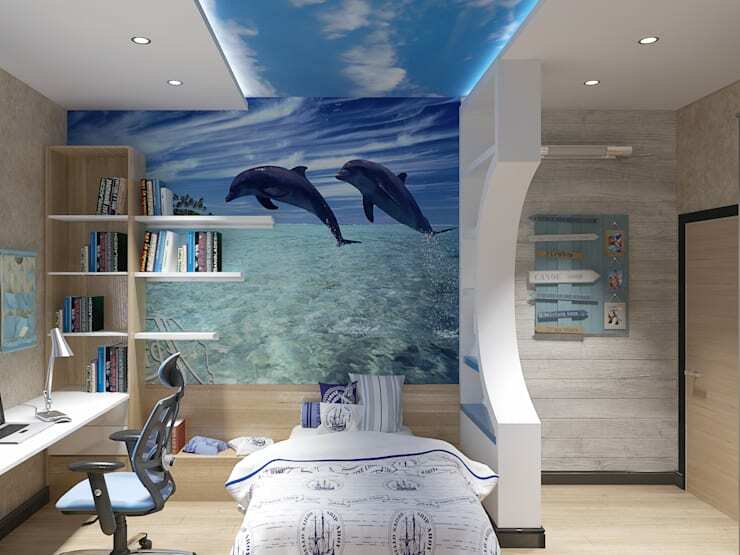 This giant image of dolphins enjoying the water is pretty impossible to ignore, so you’d better be 100% sure they’re your child’s favourite animal before you make a commitment of this magnitude. Some children change their minds with astonishing frequency, so it’s probably a good idea to ask them a minimum of 50 times before you break out the wallpaper paste. The subtle blue theme carried throughout the room, as well as the decision to decorate the ceiling with a cloud pattern, both help to create a sense of complete immersion in the scene. The quiet appeal of these vintage style sketches of Mickey Mouse in action is balanced by the far more modern, brightly coloured images on the border. Using these images all over the wall would be far too garish and overwhelmingly colourful, but keeping them to the border introduces just enough life and vibrancy to an otherwise fairly demure room. The cornflower blue paint chosen for some of the furniture, meanwhile, adds another jolt of energy. Gravity is no issue for the cars participating in an eternal race across these walls. 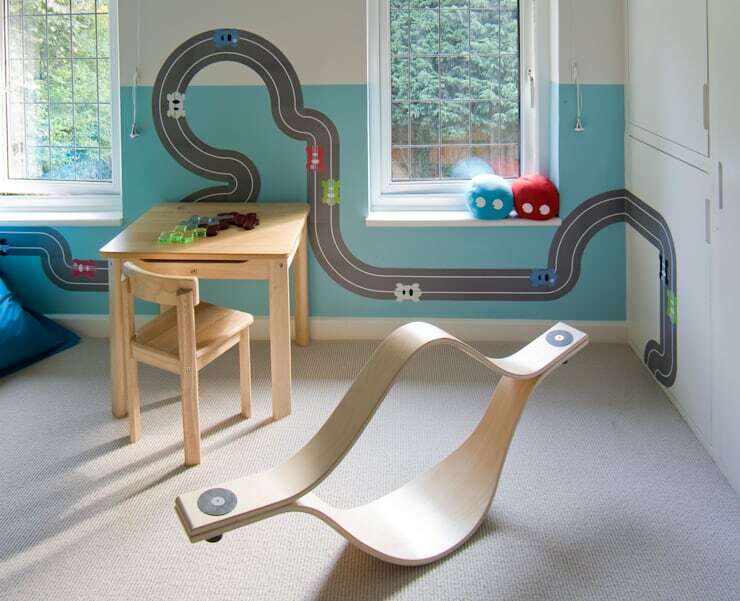 Put this paper up in a child’s room and it’s almost guaranteed that they’ll soon be zooming their own, three-dimensional toy cars along the track. It’s more or less irresistible. Although it’s not wallpaper, the unusually shapely and artistic seesaw in the foreground of this image is also worthy of note. 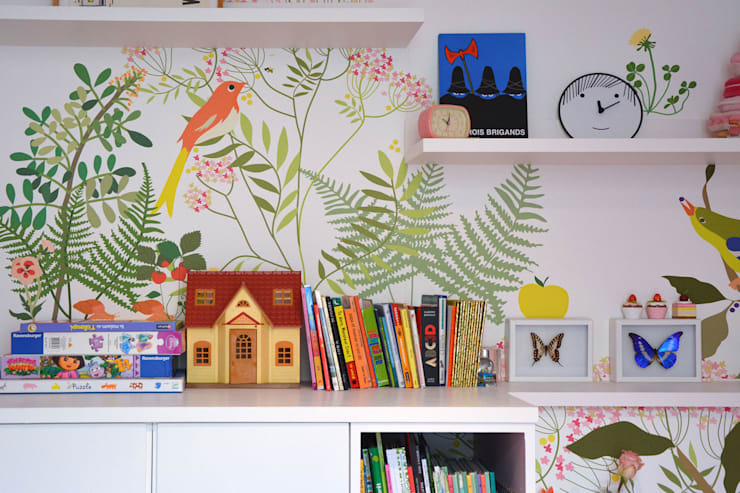 Again designed with a feature wall in mind, this wonderfully distinctive print is a must-have for nature-loving kids. The illustrations are very simple in their style, yet the perfectly realistic overlapping forms of the leaves conjure a true sense of the outdoors. 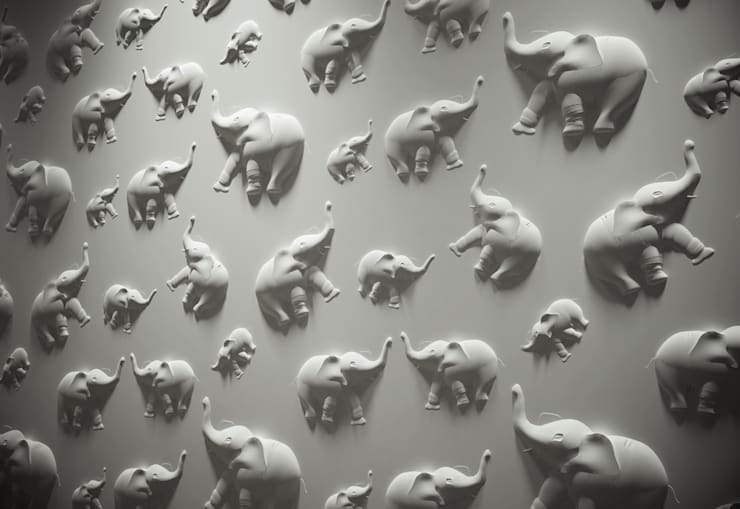 OK, so strictly speaking this 3D wall panel isn’t actually wallpaper, but there’s no denying it would be the perfect addition to the wall of many children’s rooms. We’ve already seen designs catering to those who have a soft spot for dolphins, birds and mice; now here’s one for children whose affections lie elsewhere in the animal kingdom. Which of these wallpapers do you (or your kids) like best? Tell us why!